He is one of the most recognizable names in not only Britain, but in the rest of the world - it's a claim that comedian and cultural commentator Stephen Fry isn't afraid to embrace. Stephen Fry is your Connector of the Day. Fry first came to the attention of the public back in 1982 when he appeared alongside fellow actors Emma Thompson and Hugh Laurie in the Cambridge Footlights Revue presentation of "The Cellar Tapes." After co-starring with Laurie, who is today known for his role in the television series "House," the pair began to star in a number of comedy acts together and the couple soon became known as "Fry and Laurie." In 1986, the BBC gave the duo their own television sketch show called "A Bit of Fry and Laurie" that spanned four series and was hugely successful. During the 1990s, Fry starred in a number of television shows and in films including, "Wilde" and "I.Q." It wasn't until 2003 however that Fry became a national treasure in the United Kingdom with the launch of his show called "QI"
The panel game show became one of the most watched television series and is still running. While Fry has become a sensation on both the silver screen and small screen, he has also developed a huge following online. Stephen Fry has one of the most popular Twitter profiles on social media and is well-known for his cheeky updates. Today, Fry is working on the second volume of his autobiography. 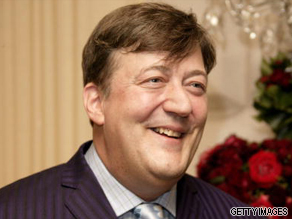 Here's your chance to quiz comedian and social commentator, Stephen Fry. You can also send in your questions via Twitter to @BeckyCNN. Stephen, how do you manage to be so awesome? We would absolutely love to have you in our store for a book signing / talk . Perhaps sometime in 2011 ? Always enjoyed your work and sense of humour. Any chance you will be bringing it and make a series in Canada in the future ? You actually stepped over the border in your "in America" series but the population was rather sparse in that area. Maybe you could pay a real visit and highlight the good, the bad and wierd aspects my home country. Actually I am a Brit as well so I enjoy the best of both worlds. Hi I'm from Baltimore, MD and was wondering– Does it get annoying that so many of the questions people ask you relate to Hugh Laurie (like this one)? Loved you in the Blackadder series and especially as General Melchett. "God is a barren featureless desert out there!" What thing made you laugh most in the last couple of days? how did you become so awesome??? What is your favorite small act of daily rebellion? Descartes (famously) said "cogito ergo sum." How do you prove your own existence to yourself? You are known to openly supprt gay rights, since you are openly homosexual yourself. Where do you stand on gays being able to adopt? I always liked Fly and remember his portrayal of Oscar Wilde in the film Wilde. Do you see yourself as an heir to those decadent writers and entertainers of the London scene such as Oscar Wilde, Noel Coward, Hugh Beaumont? You being such a literary and erudite person with a fabulous vocabulary, how do you justify your use of the downsized language on social media such as Twitter? Thanks for the years of entertainment. How could we convince you to bring a show like "A Bit of Fry & Laurie" to this side of the pond? Lord knows we could use some intelligent humor to offset all the reality TV. I'm an artist writing from Maastricht, The Netherlands. I'm a fan of your work in Blackadder and a Bit of Fry and Laurie. I'm interested to know what gives you greater satisfaction, writing or acting? According to Baldrick in Blackadder Goes Forth, in which you starred, the first world war was started by a guy named Archie Duke who shot an osterich because he was hungry. How do you think that stacks up as a cause for war compared with the causes for our current wars? You're a super technology fan, author and I'd guess have read quite a bit, so I'm wondering if you've tried Amazon's Kindle and if so what you think of it? Given Brittians post war foreign policy of alignment with and been alied to the united states of america, did Tony Blair have any choice but to invade Iraq with the US? I am writing from Jakarta Indonesia and am a huge fan of yours. Everything from Black Adder, A bit of Fry and Laurie, the Cambridge Footlight stuff , QI, Comic Relief, the travel documentaries, the article on Apple,etc. ...God Bless Youtube. What do you think of how British humour is going ? Will we see a renaissance of clever, witty humour such as Fawlty Towers and yours or is it going more the low brow way of Little Britain? If so why ? Nothing to ask Mr. Fry, he was great as General Melchett. Among your many endeavours, you have on occasion debated or conversed with people of religious conviction. Logically, the atheist rejection of non-conditional belief implies that religious people are deluded. How do you approach these conversations in order to avoid this potentially offensive premise? Can one reconcile tolerance with orthodoxy (non-conditional truth claims) and/or rationale (conditional truth claims)? Paul says in Romans that "there shall be tribulation and distress upon every soul of man who works evil". How do you manage to live through times of tribulation and distress? Oscar wilde was a controversial yet extremely likable, talented individual in his day. When taking on the role in Wilde, was it difficult on an emotional level to go through the motions of his downfall, heartbreak etc.. considering that you your self are a prolific, talented, extremely likable and openly homosexual man? Personally I think you did the most amazing job and no one else could have played that role. Could you please explain to this narrow minded world " That if the whole North Pole melted, then the water level around the world would not raise at all, as it is all floating ice and would not occupy any more volume in the water than it already does"
Thankyou, from one Stephen to another. Mr Fry, when you look back at your past, has your fame and fortune ever taken a turn again you? Friend, family, or lifestyle wise. Not sure why no one is mentioning Wooster and Jeeves... I really enjoyed that show (borrowed from the library and so, many years after the show was aired) and thought you and Mr. Laurie did a fabulous job in those roles. I also watched a few skits on A Bit of Fry and Laurie and really enjoyed the one with the man at the jail house talking to the officer and he says that his name is ...some crazy sound and eventually you punch him in the face. Hilarious! I also liked the one with the literary critic talking and talking some intellectual gibberish. It was so much fun! My question for you is: did you miss doing Wooster and Jeeves? The costumes were fantastic as well as filming at all of those beautiful country homes. Not to mention your role as the hero in each episode? Lastly, I'd like to say thank you for blessing us with your sense of humor. Oops, F.Y.I I'm an American living in Brussels, Belgium. What is he one (movie or television based) project Steven Fry would like to sink his teeth into but simply hasn't had the opportunity so far? In connection with that, would you say you are a comedy actor and happy with that moniker or does a part of you yearn for more dramatic roles? If you could invite 7 people dead or alive to a dinner party at your house, who would you invite? PS you are on my list! Im writing from Co Galway in Ireland. If you could invite 7 people dead or alive to your house for a dinner party , who wold you invite? PS you are my list! I'm from the US and would've loved to see your show "In America" but they never aired in my area. Was it shown in the US or was it about America for British tv? Will we ever get to see it here? On DVD perhaps? One recurrent idea in Oscar Wilde's short stories is that very precious gifts, which require extreme sacrifice on the part of the giver, often pass unnoticed or are misunderstood by those who receive them (e.g. The Nightingale and the Rose, The Happy Prince). I have two questions: what is generosity for you? and: why do you think we so often fail to notice or grasp the true value of the gifts bestowed on us? This is a three-part question for you. A. What is your favorite color? B. Have you ever secretly dressed up in girly frocks and referred to yourself as 'Susan'? C. Have you ever read the recently translated Gospel of Judas that completely turns the story of Jesus' crucifixion around, stating that Jesus favored Judas above the other disciples and asked Judas to follow his instructions in order to release Jesus' soul from it's earthly prison? P.S. The first two questions were just a way to warm you up for the biggie question. How much do you get paid for *continually* plugging Apple products? Purchased Jeeves & Wooster complete set & enjoy it often. Brings back some great memories for me since I am now a widow & my husband & I used to enjoy it together the first time around. Wondering if there is any possibility of our getting to see the documentary on you & Hugh here in the US. (NY State) Hope so. I thoroughly enjoyed your documentary on bipolar disease. As the parent of a bi-polar adult son, how can I best support him? What should I avoid? "The Red Hat of Pat-Ferrick!" Hi Stephen, excellent work all round. A mainstay of British comedy and cornerstone of British TV with QI. Legend. Question : It couldn't ever be possible that Fry and Laurie do another series, could it? Could it? Perhaps ... it could. Or could it. Goodnight. Will there ever be a sequel to P.G. Wodehouse's much acclaimed Jeeves and Wooster? Your narration of The Hitchhiker's Guide to the Galaxy and LittleBigPlanet have brightened my life as well as the lives of countless other fans. To what extent are you a liberal, and to what extent are you a conservative? Where do you get your kababs and do you use the white sauce or the Thai chilli or both? Do you have any political aspirations and if so would you ever consider offering yourself up for election? I am extremely alarmed by the concept of the operating theatre. I do not want to discover at some time in the future that Richard III is performing brain surgery on my girl-friend. My serious question is: don't you agree that comedy for the most part is a defence mechanism for people to avoid confronting their fears? I know it is in my case. You always seem to feature on people's fantasy dinner table lists - and rightly so. Your wit and intellect would be a credit to any gathering. But who would you least like to be around a dinner table with - and why? I like you have long rubbed shoulders with the famous and powerful. I once had a long conversation on a train with Colonel Gaddafi's personal Pilates instructor who later went on to be his Minister for Agriculture. But seriously, when you gave a lecture at Winchester College 20 years ago you said that the formula for comedy fundamentally lies in the breaking of expectations. Would you care to elaborate? Several years ago, you and a group of like-minded Jewish-British personalities (including Harold Pinter and Steven Berkoff), established a Jewish association that would present a more liberal image of Jewry worldwide, particularly in the USA, where Jewish people are represented by large well-funded lobby groups that support Israel first, often to the cost of non-Israeli interests. Those American flag-bearers for Israel (and Zionism) distort the true concerns and needs of Jews throughout the world and their dominant voice needs to be challenged. What has happened to your group? Were and are you able to do anything? Have you and your associates been silenced by the backers of the ADL and other supporters of Likud, Zionism and Israel's very dangerous current Foreign Minister? 1) Will you be back on Bones? 2) Just because obviously I dont know and you have huge brain, what is a "Snookie"? So....why 42? perhaps more importantly, will you ever tell us? Could you please stop your friend Hugh Lurie from driving up the cost of American health care with all those expensive tests he runs to no avail before getting a flash of insight unrelated to any previous test? It has become most tedious. Man-handle him back to Old Blighty and put him to something less repetitive and predictable – you could call it Laurie & Fry this time. I've just one question; i was just curious if you like "The Royle Family "as well... and isn't it brilliant tv that we unfortunatly see not much. I love your books, especially the novels. The humour, the gentle insights into human nature and just simply the fact that you know how to weave a memorable story. These days you seem mostly busy with television, so I'd like to know if there's any chance we'll see a new novel or perhaps a collection of short stories? Forgot to say I'm writing from Copenhagen, the Zircon of the Baltic. I'm as pleased as Punch to see another volume in your autobiography coming out, but will you be writing any more novels? I have fond memories of being stared at by disapproving elderly women on a train because I was reading "The Liar" and literally lol-ing. Great stuff! What's it like living with Bender? Does his constant partying cut into your Leela time? is there any chance that we might see you playing a patient/doctor/former boyfriend etc. on House md? If you had been a genius at math as well, do you think your life and career would have been significantly different ? I am an atheist. In discussions and conversations, I am very happy to point out all of the faults and dangers of religion. I have a problem about Islam, though – Should you hold back with criticism of a religion, when so many of it's followers are having a difficult time as minorities in a western country... And at the same time: am I a coward for not daring to criticise one religion in public, but at the same time really go after the ones that are (probably) safer to aproach? Why are so many people superstitious? Is it fear of death? Will you ever appear on House with Hugh Laurie? If distance lends perspective, how do you see American intellect? Rising? Falling? Holding steady? What is your opinion regarding our continued reliance on the death penalty? I have to say, that I love your show QI. It is fantastic. Living in Canada though, I have to watch it all online, piecemeal. Any chance of you "putting in a word" to get it onto BBC Canada or any other Canadian broadcaster?? Have also been diagnosed with BPS and an IQ of around 150. Am curious to know how you deal with things when you are perceived as "manic" and yet just having a damn good idea. Once people know you are diagnosed, then every idea you have is either racing thoughts or mania. I don't believe this, but how have you been able to overcome this? Just saying, "don't listen to them" does not work. We have to live in a community. I would appreciate any insight. I have often wondered why the speed of light always measures the same (in a vacuum) no matter what speed the observer. This is described by Einstein's theories of relativity. One thing bothers me in particular and that is what would be the measured speed of light relative to another photon if travelling in say the opposite direction and what effect would that have on time for the observing photon? why have you never messaged me on grindr? I read Moab is My Washpot earlier this year and thought it was just wonderful, so I'm really looking forward to The Fry Chronicles. Do you have any idea when it will be available in the U.S., and whether you'll be doing any book signings here? Please insist to the powers that be, QI must be broadcast in Canada. I grow tired of having to strain my eyes to watch it on YouTube. It's the funniest and most informative on the TV. I am in love with almost every thing you say and do. I can't help but wonder, however, why you're still such an enthusiastic MacHead. With all the stories about its censorship of apps and inciting the police raid of Jason Chen's home, Apple Inc. seems more and more to me like a force working against internet freedom. How can you justify sticking by them? Oh, and when's the next time you're coming to New York so I and every other Anglophilic geek in the metro area can stalk you? (note to police/bodyguards: jk). –	What needs be done to Improve the Education rate in Entertainment Industry, so that there is Education for ALL? –	What needs to be done to make Entertainment Industry more attractive for Investors? –	What can we expect from you in the coming years? I am looking forward to hear from Stephen Fry. about your collaborative work with Hugh (Laurie), how did the absurd and the funny come to life? Why did it end and do you envision another collaboration in the future? Hate to be tiresome, as you hear this all the time, but your genius truly astonishes me anew with each book, film, television & radio series you present. Can you tell us about your new svelte physique? You look, as we here say in Manhattan, absolutely mahvelous. I hear through the grape vine that you and hugh might be doing another final season of fry and laurie and if so will it come out on dvd so the people aaround the world love you and hugh as much as i do can put it with our collections?